Tinnitus is defined as hearing noises in the ear(s) or in the head. It is a widespread condition that affects an estimated 50 million Americans. Some people describe their tinnitus as a ringing, hissing, roaring, whooshing or buzzing sound in the ear. It may be sporadic, or it may be constant. 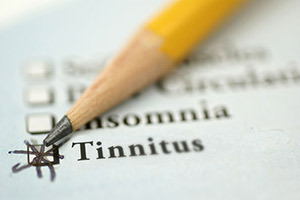 Tinnitus is a symptom rather than a disease itself. Tinnitus sounds different to everyone. Sounds can vary in volume and may present as a buzzing, humming, whistling or other noise. More than 200 drugs are known to have tinnitus listed as a side effect. Tinnitus is not a disease itself, but rather a symptom of an underlying health condition. Most commonly, tinnitus is a symptom of untreated hearing loss. Tinnitus can’t be cured, but there are treatment options that make it less of a distraction. The approach to be taken depends on the underlying condition responsible for the ringing in your ears. For individuals with hearing loss as the underlying condition, hearing aids are the best treatment plan. Counseling, cognitive, behavioral or relaxation methods can be practical in helping you manage your tinnitus symptoms by reducing the stress, anxiety and sleeplessness that are often associated with tinnitus. Others benefit from noise suppression therapy or masking techniques designed to cover up the noises heard. White noise machines, fans, air conditioners and humidifiers are also popular and easy to use options.